Help save our bees – courtesy of Tesco. Donate some bags of sugar! 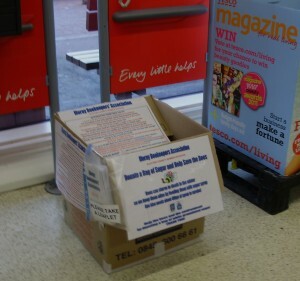 Moray Beekeepers have taken the initiative to ask our local supermarkets to assist in their bee feeding programme. Any members of the public who are so inclined will be able to find boxes at either Forres, Elgin or Buckie Tesco stores. for the next three weeks from July 18th – 8th August so please tell all your friends and other like minded people that we will be very glad of their help. The focus of our initiative is to ask members of the public to donate a bag of cane sugar with a view to them helping the local beekeepers both prepare their bees for the winter and ensure that there is adequate food for the bees over that period. Please help us by telling everyone about our project. Many thanks.